Shirts With Random Triangles: Is Kyler Murray Soon To Be An Ex-Texas A&M QB? The news comes five days after former Texas A&M QB Kyle Allen left the Aggies football program. 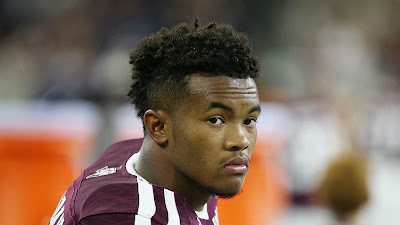 The move could leave the Texas A&M program in a bind, with five QBs on scholarship, none of which have any major playing time in a CFS college team game. Expect this move to cause fans to the heat up on Texas A&M head coach Kevin Sumlin a little bit higher.